Adorn your house or workspace with custom holiday signs that reflect your personality. The holiday season is here, and that means it’s time to put up the decorations. 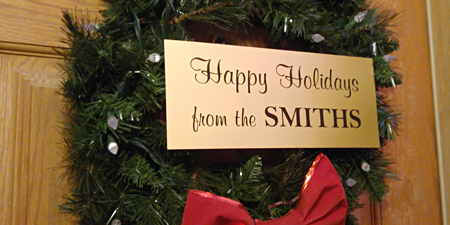 Why not add custom holiday signs to your collection? Signs are a great way to show holiday cheer in your home and workplace. And, customizing them allows you to express your personality. For businesses, custom signs can convey work hours and wish customers happy holidays. However you choose to use them, the quality of these custom signs makes them eye-catching and durable. Here are four types of holiday signs to customize for business or personal use. 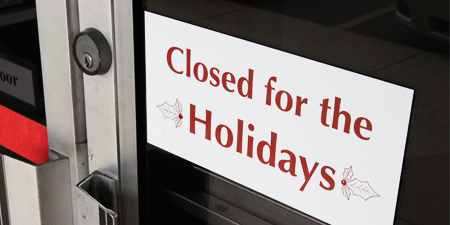 Let your customers know when you are closed for the holidays with a custom office sign. Signs may also promote your business’s holiday and after-holiday discounts. Wish people happy holidays from your company or family. Customers and neighbors will appreciate your season’s greetings displayed on your door or window sill. Have a favorite Christmas movie or carol? Customize a sign to display your favorite movie quote or song lyric and add that personal touch to your holiday decor. Have fun creating your holiday signs! Custom signs come in your choice of size, color, font and design. Additional options include round or square corners, border or no border, and gray or black frame. For hanging, order signs with pre-drilled holes for screws, or pick from several adhesives to have attached on the back. Hang holiday signs from the walls of your home or office, or display them in the window. Attach a sign to a Christmas wreath using two Swivel Bulldog Clips on the back. The best part about custom signs is that they are large enough for you to say whatever you want so that you can express your love for the holidays in your own way. we have custom shapes to meet any need. Name tags are meant to be personal, they are meant to be unique. They have your name on them after all, so why not make them a little extra special? 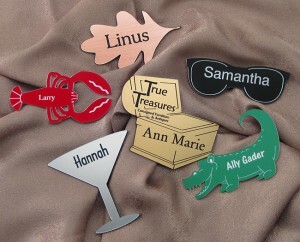 At Name Tag, Inc. you can choose a custom shape for your laser engraved plastic name tags with practically any shape you would like. Our unique, custom shaped name tags allow you to create a name tag that represents your company or cause completely and exclusively. Highlight the shape of your logo or simply draw more attention to it by choosing from one of our custom designs. Choose from a variety of stock shapes, such as an oval or a circle. While we have these stock shapes, if we don’t have the shape you are looking for, we also have a design team on hand that will work with you on a shape to meet your specifications and to help out with those extra little ideas. For those wanting your brand or logo to really stand out, the custom shaped name tags are definitely the way to go. Provide us with your logo and give us a list of names and titles of employees or volunteers to customize each name tag. Now that you’ve gone to the trouble of requesting a personalized, engraved plastic name tag and provided a list of names and the perfect logo that represents your company or cause, you can add that extra bit of flair with a shape that will really make you stand out. A name tag with a custom shape, color and size makes a visual verification of the name tag easier. These name tags draw the customers’ eyes straight to you, leaving them with nothing to wonder. The different shapes or sizes will help make your name tag stand out from the crowd. Just let your imagination run wild and design a badge that will separate you from your competition.